This page is one of the type that I sometimes write: an introduction to a concept or topic or idea and an Excel page. If you don’t want all of the background, go straight to the Excel file (link at the bottom of the page) I have provided and play around with it. Otherwise, read on! The purpose of this page is to introduce and explain the concept o the skewness of data. Initially, we will discuss the descriptive statistics utility in Excel, in which we find a value for skewness. Once we have appreciated one way to find that value, we will explore the concept in much greater detail. If the world were perfectly round and green cheese from the Moon were easy to obtain free of charge, we needn’t worry about skewness. In a perfect universe, all calculations are simple, relationships are linear and conclusions are easy to draw. However, life’s not like that and in many cases, the normal distribution does not apply. Skewness in a data set shows this situation very well. By skewness we mean that the mean, the median and the mode are not equal to each other, as is the case with the normal distribution. 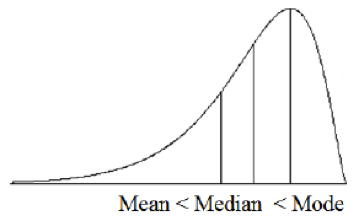 In some cases, the mean is greater than the median and in other cases the median is greater than the mean. When the mean and the median are not the same, it is likely that some level of skewness is present in the data set we are analysing. The following section shows how we can start to see whether our data set is skewed. The Data Analysis ToolPak should now install and you might have to restart Excel to see it. For each data series you choose, you will be presented with these two columns: it’s best if you select the Labels in first row option to give a meaningful name to each data series in this output. You can see a value for skewness just over half way down this list and that is what we are looking for. Please note: the descriptive statistics output from the ToolPak is static, non volatile. What this means is that if you change your data in any way or even change one data series for another one in the same input range, these outputs will not change. 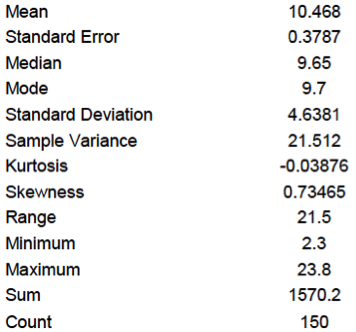 To update these results, you would have to run the descriptive statistics utility again. In this case, we see that the mean, the median and the mode are all equal to each other and if we slice the diagram down the centre from top to bottom, the left hand side will be equal to the right hand side: the normal distribution. That is, in the data that are skewed left, there are more values larger than there are smaller and vice versa for the data that are skewed right. 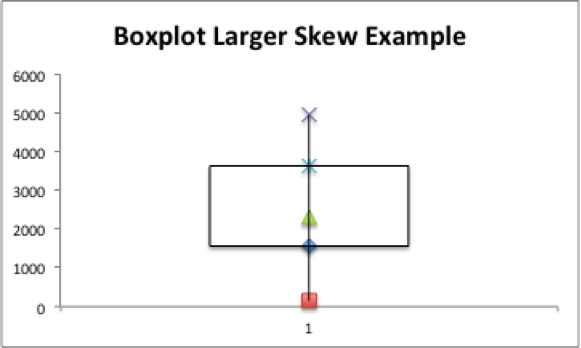 We find a value for skewness from Excel when we use either the Data Analysis ToolPak’s descriptive statistics utility and when we use the SKEW() function. Note: Excel for Mac 2011 does not have the descriptive statistics utility installed so we have already outlined how to use the ToolPak in this context, assuming you are using Excel on a Windows machine. Now let’s see how to use it the SKEW() function which is useful for Windows users by necessary for Mac users. In cell E5 enter =SKEW(A7:A14) and press enter. You should see the value -0.4587 in that cell now. Change any of the input values and see how the value of skewness changes too: change one value or more or all of them. Once you have experimented with this feature of the function, go back to the data set above. 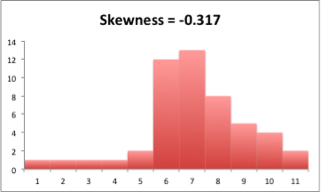 The skewness value of -0.4587 tells us that these data are negatively skewed; and since the median is greater than the mean, that confirms the negative skewness (see below). Does the histogram below confirm that? Hmm, it’s a bit tricky in this case, so read on! There is an Excel work book to accompany this page that is free for you to download, see the link at the bottom of the page. On the tab larger_skew, you will find a data set comprising 50 data points. Take a look at that work sheet to see everything I have done there. In the end, you are presented with this graph of the data, in the form of a histogram: before you read on, try to estimate the SKEW value from this graph. SKEW() gives us the value of 0.1175: that is, positive and not such a large value. Again appearances are deceptive: just look at the data carefully, check the calculations to see that skewness is 0.1175, positive and that the mean > median. 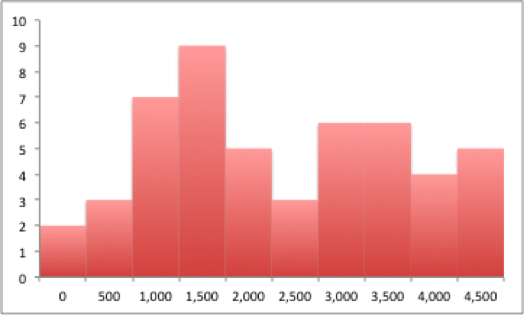 However, the histogram appears to show a negative skewness. Sorry, it’s just the way these data are appearing and it helps to demonstrate why most graphs need to be supported by calculations rather than just left as standalone evidence. 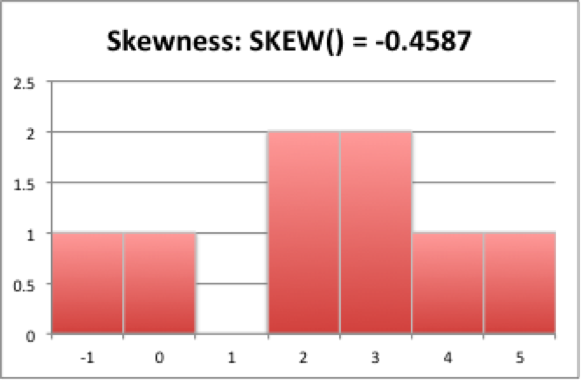 Take a look at the next section, general measures of skewness which helps us here. 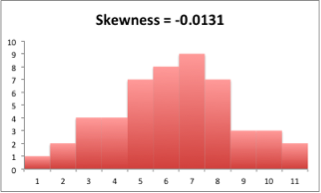 The value of 0.1175 for skewness shows that the data are relatively symmetric so we need to be ready to be deceived by a graph!! When you get to the Simulation of Skewness section of this page you can see that you can also look at the simul_large worksheet and press the F9 key you can see as many examples as you like of what positive and negative skewness can look like: including skewness values between -1 and +1. I have used the relationship between the mean and the median in our skewness analysis already; but here is the confirmation of that relationship. 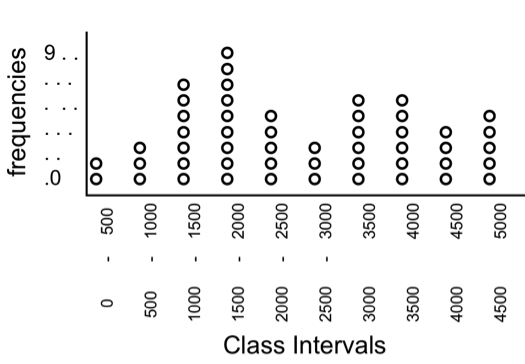 If the mean = the median, this means … ? What do you think? 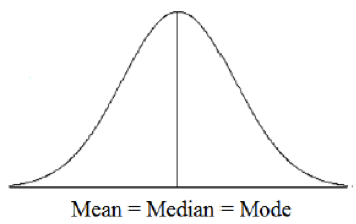 essentially, the mean is the best measure of central tendency if the data set does not show excessive skewness. Otherwise, you should use the median as the measure of central tendency. The reason here is that extreme skewness distorts the mean and when this happens, the median is the better alternative. 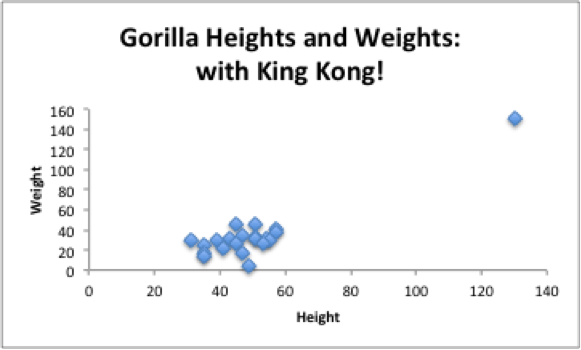 There is the example of what is called the King Kong Effect to illustrate the distortion of the mean: this example works as you see below. In this case, the mean and median are 46.05 and 47 respectively and the skewness coefficient is -0.3980. Note the graph is an XY scatter graph and not a histogram so we cannot use it to predict or confirm the direction of skewness. 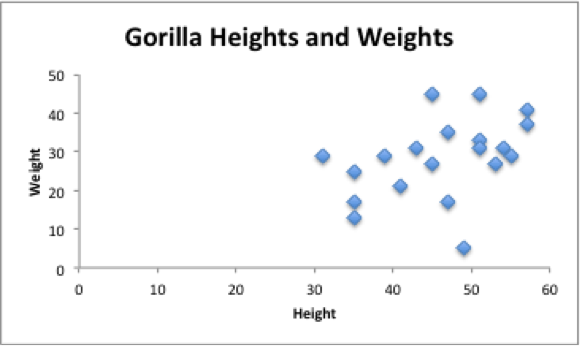 Now, the mean and median are 50.05 and 47 respectively; but the skewness coefficient is a huge 3.4594 meaning that skewness has gone from negative 0.34980 to positive 3.4594 and all because we added King Kong to the list, just one more data point. In this case, this function is entered in cell D8 and then filled down to D57. This simulation assumes we are dealing with the normal distribution and it generates values based on that idea together with the mean and standard deviation of our first example or sample. In cells E8:E57, which are “helper” cells, is the function =RAND() which we see in the NORMINV() function as the first element, probability: in this case the probability can be any value from 0 to 1 or 0 to 100%. Since these numbers are random and volatile, every time you press the F9, calculation, key, you will generate a completely new simulation, based on the mean and standard deviation provided. I built this model specifically so that you can press the F9 key over and over again to help you to learn what different values of skewness look like. In fact, the title of the graph is linked to cell H10 in which you will see this: =F10&” “&ROUND(G10,4). I have labelled the middle graph as negative, right; but in reality it is almost skew free because the value is almost zero … go back to the second example, the larger_skew worksheet, above to confirm that we are dealing with similar situations here. Open that spreadsheet file, go to the simul_large tab and press the F9 key over and over to see a very wide range of values of skewness. What the above discussion tells us is that we can use skewness as a measure of symmetry. 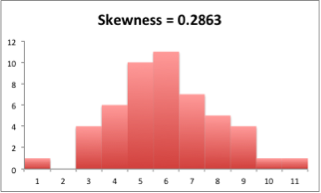 If the skewness = 0 then the distribution represented is perfectly symmetric and the mean = the median. 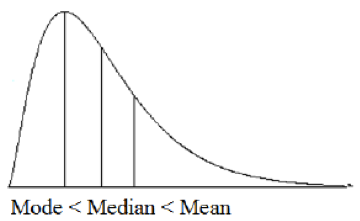 As we have seen, when the distribution is positively skewed the mean > median and when the distribution is negatively skewed the mean < median: see the graphs and discussion above again as examples. where x̄ is the mean and s is the standard deviation of the data we are analysing. This boxplot is included in the Excel spreadsheet that accompanies this page and a description of how to construct one is given in my Excel book, reference at the bottom of the page. This dot plot is included in the Excel spreadsheet that accompanies this page and a description of how to construct one is given here in this blog: it’s an advance on the REPT() function way of graphing data without the need for a graph!! This page has shown how to calculate the value of skewness for a data set using two main techniques: the Data Analysis ToolPak and the SKEW() function. Skewness tells us by how much a data set might deviate from the normal distribution and it is a vital aspect in the analysis of data since we often assume data are normally distributed when, as we see here, sometimes that is not a valid assumption. Thank you. I am glad you appreciated it. This is an excellent article. Once I have randomly generated a normal distribution in excel where the mean = median, how can I skew it in excel to change its shape? thanks, just what I needed to understand. Skewed Left: long tail points left .Is that should be represented as -ve skew in the diagram? The diagrams are correct. I used to have the same problem, which is the language of statistics. What they mean is, for example, if there is a positive skew, most of the values are to the right hand side of your distribution … more and more values are positive or nearer positive than negative. It’s something we just have to learn! Best wishes and thanks for writing and visiting!